When most people think about the Amish and Mennonite communities, they picture horses and buggies and houses without electricity. People come from all over the world to study their society and buy their quilts. As someone who grew up Mennonite, I can see why the lifestyle is interesting, but I think the history and theology that inspire this way of living are much more meaningful. They’re typically seen as one of the most conservative sects of Christianity, but in reality their beliefs have repeatedly compelled them into struggles for justice. Similarly, the lessons that I was taught as part of my childhood religion are inextricably linked to the socialist beliefs that I hold today. The Anabaptists, since their inception and to this day, commit themselves to strict adherence to simple principles preached by Jesus. This commitment led to a turbulent formation and a militant alliance with the peasants of Germany. Their failure to successfully implement changes to the church and state would eventually drive them away from mainstream society and towards the secluded lifestyle that is so associated with them today. The story starts with the Protestant Reformation. In 1517, Martin Luther wrote the Ninety-Five Theses which criticized the Catholic church’s use of indulgences to raise funds and, more broadly, its ability to cast judgement on other people. Luther quickly found himself on the receiving end of calls for excommunication and even burning for heresy. His conflict with the Catholic church seemed virtuous, but as princes around Europe began to see the benefits of a separation from the Catholic church, Luther allied himself with those same nobles and royalty. However, there was another wing of the Protestant Reformation — the Radical Reformation. The Radical Reformers were inspired by the early church’s clash with the Roman Empire. They saw states as fundamentally corrupt and large church institutions, like the Catholic church, as unbiblical. They sought to purify the religion by decoupling it from institutions larger than a community church and improving the lives of regular Christians. One of the principles derived from this separation from power is that Christianity is a personal choice and cannot be forced on other people. This is where the Anabaptists (Rebaptists) get their names. They refused to baptize babies and instead baptized a person when they felt that they were ready to commit themselves to God. This practice is common among Protestants to this day. This split in the Reformation came to a head in 1525, when the peasants of Germany rose up against their feudal lords in response to a ferocious consolidation of power that turned landowners into serfs and pushed serfs deeper into servitude. Luther condemned the rebellion in his piece Against the Murderous, Thieving Hordes of Peasants. Preachers of the Radical Reformation, on the other hand, actively inspired and supported the peasants in their rebellion. As clergy were the intellectuals of their time, they helped the peasants formulate their demands to the nobility in The Twelve Articles. They demanded an end to serfdom, public ownership of nature and natural resources, a public institution to regulate rent prices, and more control over the amount of work they did. Some of the Radical Reformers even provided military support to the peasants. 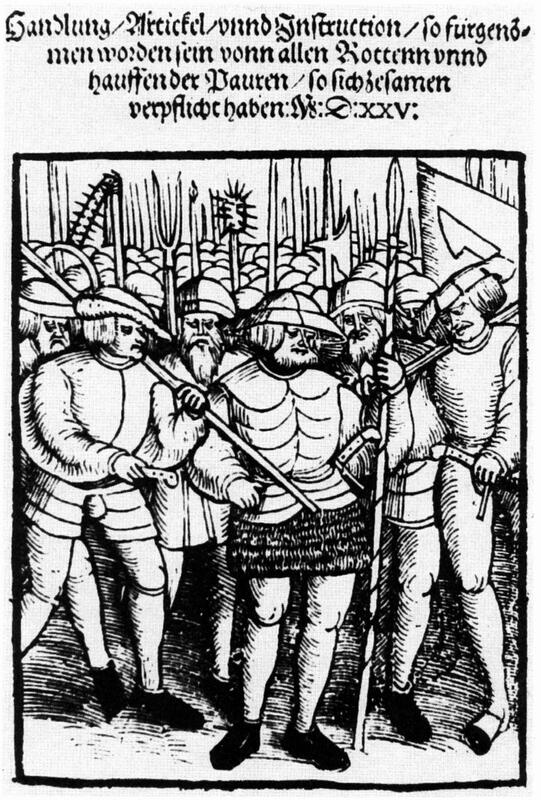 Thomas Müntzer created an armed militia called the “Eternal League of God.” The peasant army had a military structure with evolving tactics. They were poorly equipped and relied on the mobility of their wagon forts to stand a chance against the princes’ armies. Unfortunately, this was not enough and the uprising was smashed by the end of the year. About 100,000 peasants were killed. The German Peasants’ War was extremely formative for the next generation of Anabaptists. It deepened their beliefs about the corruption of governments. There would be smaller uprisings over the next century and they would be put down with the same viciousness as the first. Many of the Anabaptists started adopting pacifism as a core belief because of Jesus’s refusal to use violence and surely as a reaction to the violence they had endured. Many Mennonites and Quakers, groups that originated from the Anabaptists, left Europe in the 1680s to settle in William Penn’s new colony, now Pennsylvania, because of his promise of tolerance. They settled in Germantown. By the time they arrived, slavery was an entrenched part of the economy. Some of the wealthier Mennonite-Quakers, like William Penn, purchased and traded enslaved workers. However, there were brighter spots. In 1688, a group of four Mennonite-Quakers drafted the first petition for the abolition of slavery in the United States. They saw parallels between their struggle for religious freedom and a person’s right to freedom from slavery. The petition went so far as to say that by The Golden Rule, the slaves had the right to revolt. By the American Revolution, slavery had been essentially eliminated within the Mennonite-Quaker community. The group would continue to petition the Continental Congress and the United States Congress for the abolition of slavery. The Mennonites did not support the American Revolution. Their literal translation of the Sermon on the Mount, Jesus’s most difficult set of moral demands, commanded them to “turn the other cheek” and “love your enemy.” When they were eventually legally forced to participate in the conflict, they refused to fight and opted to help in other ways. The Mennonites have not left their ethical tradition behind. Their anti-war commitment continues to this day. I’ve known many Mennonites who were conscientious objectors. Those quotes from the Sermon on the Mount were repeatedly spoken by my grandparents. They served as the basis for the morality that I hold today. The Radical Reformers’ fight alongside the German peasants, the Mennonites’ rejection of slavery, and their anti-war tradition orbit the struggle for socialism. While I wasn’t aware of this history until recently, I can see how the same principles and teachings that drove my ancestors to fight for a better world are the same ones that compel me to action in an age of endless war and economic inequality.